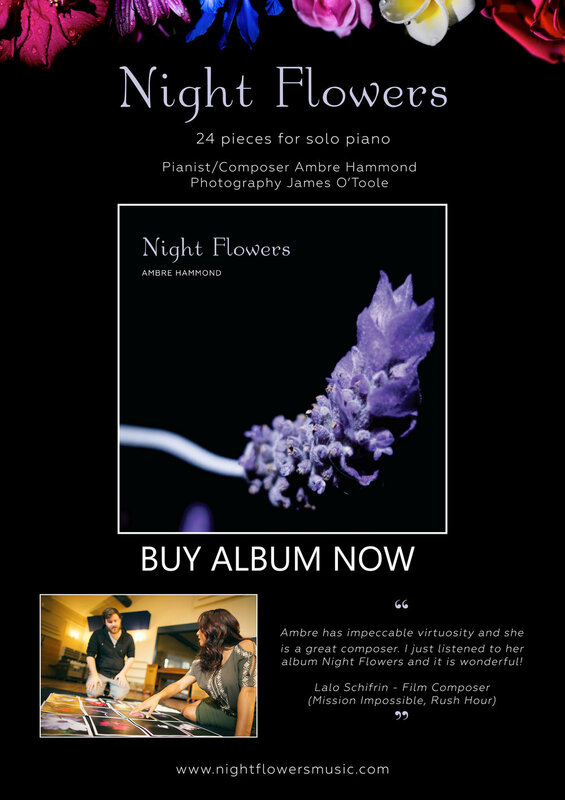 Classical pianist, Ambre Hammond, completed her Associate and Licentiate Diplomas in Piano as an eleven year old, while being home-schooled in Moss Vale, Australia. Her debut with orchestra at age 16 was playing the Concerto No. 3 by Rachmaninoff with the Orquesta Sinfonica de Cordoba in Argentina as part of her first prize in the International Music Competition of Cordoba. In 2016 Hollywood based composer, Lalo Schirin composed the Double Concerto for Classical Piano and Jazz Trumpet for Ambre and James Morrison. They presented the world premiere of this work in 2017 with the Sydney Symphony Orchestra at the Sydney Opera House to considerable acclaim. More recently, Ambre has added composing to her list of accomplishments. She has released two albums of compositions for solo piano. Akasha (2016) has guest appearances by Marcello Maio (accordion) and Phil Stack (double bass). Nightflowers (2018) - 24 vignettes for solo piano inspired by the photography of James O'Toole. Ambre has introduced these pieces to Australian audiences in regional tours throughout Victoria, Tasmania and New South Wales and through regular radio interviews and performances. Ambre's mission is to bring the thrill of beautiful, classical music to people in places where such joy is sadly missing. Under the auspices of her Girl Piano Truck initiative, Ambre has travelled by truck with a keyboard, giving concerts for the inmates of a mental asylum in Belarus; to the destitute living at P’ayatas’ - the largest inhabited rubbish dump in the Philippines; to orphanages in Africa and to those living in the poorest conditions in India, East Timor and Thailand. In 2019 Girl Piano Truck heads to outback Australia. Ambre is in demand as a motivational speaker, with regular appearances at venues throughout Australia. She has also had speaking engagements in America, and most recently (2018) was the keynote speaker for Corning Gorilla Glass in Singapore. ‘Oblivion’ (2012) Music by Piazzolla with Marcello Maio (accordion). “I had the privilege to work with Ambre Hammond on one of my most demanding compositions, which was premiered in Sydney, Australia (my "Double Concerto for Trumpet, Piano and Orchestra"). Needless to say she has impeccable virtuosity. And now she is bringing up another facet of her musical personality: she is a great composer. I just listened to her "Night Flowers" and it is wonderful! My warmest congratulations to Ambre”. Thank you for being in touch!